A vagrant is a tool for building and managing virtual machine environments in a single workflow. With an easy-to-use workflow and focus on automation, Vagrant lowers development environment setup time, increases production parity, and makes the “works on my machine” excuse a relic of the past. It provides easy to configure, reproducible, and portable work environments built on top of industry-standard technology and is controlled by a single consistent workflow to help maximize the productivity and flexibility. After successful installation of VirtualBox & Vagrant, now, we can create an Oracle Database Vagrant box. Then, download a configuration file from GitHub by click on Clone or Download into your local machine. There is another option to the configuration from GIT command but that, I will cover in another post. You will need to download the Linux x86-64 zip file of Oracle 18c. Now, I will unzip the Vagrant files on my local machine. C:\HashiCorp\Vagrant>vagrant -v Vagrant 2.1.2 C:\HashiCorp\Vagrant>vagrant -h Usage: vagrant [options] <command></command>  -v, --version Print the version and exit. -h, --help Print this help. Common commands: box manages boxes: installation, removal, etc. destroy stops and deletes all traces of the vagrant machine global-status outputs status Vagrant environments for this user halt stops the vagrant machine help shows the help for a subcommand init initializes a new Vagrant environment by creating a Vagrantfile login log in to HashiCorp's Vagrant Cloud package packages a running vagrant environment into a box plugin manages plugins: install, uninstall, update, etc. port displays information about guest port mappings powershell connects to machine via powershell remoting provision provisions the vagrant machine push deploys code in this environment to a configured destination rdp connects to machine via RDP reload restarts vagrant machine, loads new Vagrantfile configuration resume resume a suspended vagrant machine snapshot manages snapshots: saving, restoring, etc. ssh connects to machine via SSH ssh-config outputs OpenSSH valid configuration to connect to the machine status outputs status of the vagrant machine suspend suspends the machine up starts and provisions the vagrant environment validate validates the Vagrantfile version prints current and latest Vagrant version For help on any individual command run `vagrant COMMAND -h` Additional subcommands are available, but are either more advanced or not commonly used. To see all subcommands, run the command `vagrant list-commands`. 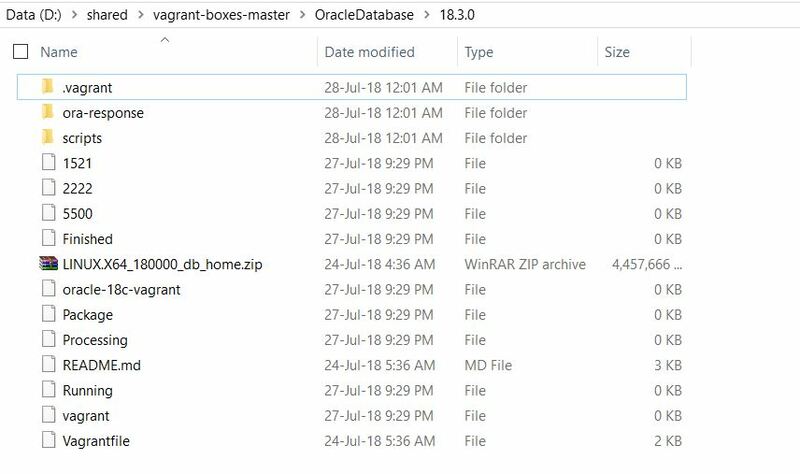 Next, we will have to move the vagrant-boxes/OracleDatabase/<version> folder of the version we would like to build and then copy the Oracle Database installer zip file into the folder. In my case, I will install Oracle 18c, So we will move D:\shared\vagrant-boxes-master\OracleDatabase\18.3.0 and copy installer here. Now, we are ready to fire Vagrant UP command to install VirtualBox with Oracle Database 18c. oracle-18c-vagrant: this with a newly generated keypair for better security. ==> oracle-18c-vagrant: Machine booted and ready! oracle-18c-vagrant: Delta RPMs disabled because /usr/bin/applydeltarpm not installed. oracle-18c-vagrant: [WARNING] [INS-32055] The Central Inventory is located in the Oracle base. oracle-18c-vagrant: ACTION: Oracle recommends placing this Central Inventory in a location outside the Oracle base directory. oracle-18c-vagrant: [WARNING] [INS-13013] Target environment does not meet some mandatory requirements. oracle-18c-vagrant: ACTION: Identify the list of failed prerequisite checks from the log: /tmp/InstallActions2018-07-27_02-33-04PM/installActions2018-07-27_02-33-04PM.log. Then either from the log file or from installation manual find the appropriate configuration to meet the prerequisites and fix it manually. oracle-18c-vagrant: Successfully Setup Software with warning(s). oracle-18c-vagrant: Changing permissions of /opt/oracle/oraInventory. oracle-18c-vagrant: Adding read,write permissions for group. oracle-18c-vagrant: Removing read,write,execute permissions for world. oracle-18c-vagrant: Changing groupname of /opt/oracle/oraInventory to dba. oracle-18c-vagrant: The execution of the script is complete. oracle-18c-vagrant: Copyright (c) 1991, 2018, Oracle. All rights reserved. oracle-18c-vagrant: [WARNING] [DBT-11209] Current available memory is less than the required available memory (1,536MB) for creating the database. oracle-18c-vagrant: Look at the log file "/opt/oracle/cfgtoollogs/dbca/ORCLCDB/ORCLCDB.log" for further details. oracle-18c-vagrant: Copyright (c) 1982, 2018, Oracle. All rights reserved. oracle-18c-vagrant: Created symlink from /etc/systemd/system/multi-user.target.wants/oracle-rdbms.service to /etc/systemd/system/oracle-rdbms.service. oracle-18c-vagrant: INSTALLER: Installation complete, database ready to use! Now, we can check whether Vagrant is started or not. In the next Article, we will see how to access the database in Vagrant VM and stop & destroy Vagrant VM.